When only minor changes are made to software that we have released, we may not always write blog posts about these changes. There may not be many changes to our Android app titled “Is This Gluten-Free?” that would be noticed by users who upgrade to the latest version of it. In fact, the only change to it that may be noticed is that submission of the product name through the device’s soft keyboard should work more reliably on some devices. However, there have been changes that have been made to the app that may not be easily noticed. And when changes like these are made, there might be issues with them. 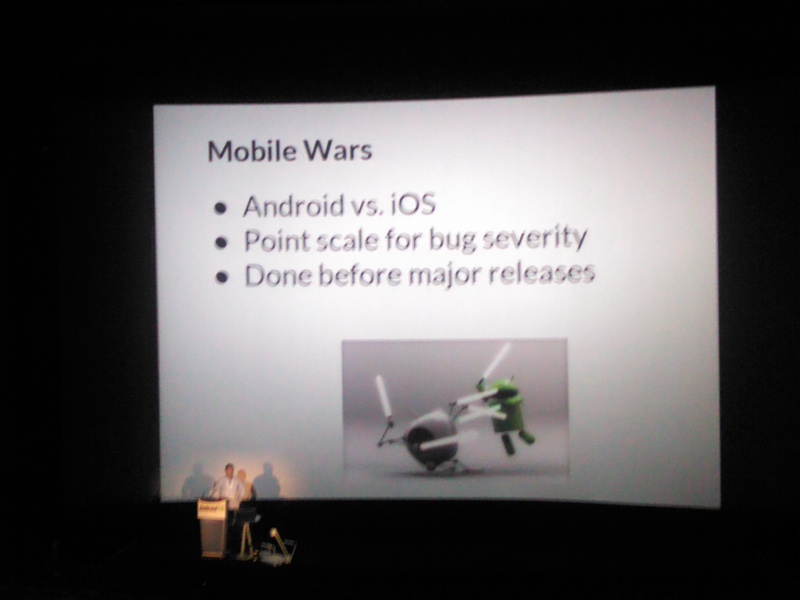 And even though we try to test our software thoroughly before releasing it, some bugs may be found by users of it. And if anything is found to be wrong in version 1.0.3 of this app, we would like to be informed of it so that these issues can be corrected in version 1.0.4 of it. We have created this app to try to make it as convenient and easy as possible to determine whether or not products are gluten-free. And if there are any questions or comments that you have about this app, you may leave them in the comments section here. Unlike reviews on the Google Play website, there is no limit to how long comments on the app can be on this site. So if you would like to go into much detail about everything that is wrong with this app, you may do so here. However, we try to make this app good enough to make users of it tell us about how good it is, and hope that that is what you will want to do after using the latest version of this app. Posted in Android Apps, Is This Gluten-Free. When we release new versions of our applications, we may not always post about the changes made to these applications on this blog. However, the changes that we made to our Android app titled “Is This Gluten-Free?” that you can find on the Google Play store here were significant enough for us to post about them here. We found that the app was not successfully retrieving information on product names from databases as often as it previously did. There were changes that needed to be made to the way in which the app requested data from these databases. After these changes were made, the app is now more likely to retrieve the information on the names of the products after you scan their barcodes. Another change that you may notice in this new version of the app is that the search button below where a product name would be entered has been made larger. We decided to do this after a reviewer of this app made a good point about how the search button should not be on the left side of the screen. As we do listen to users of this app, we decided to make a change to the search button that we believe is an improvement. It now takes up the entire width of the screen, and so it is now in a location where it would be expected to be. A screenshot of the updated product search screen is below. We will continue to look for ways to make this app work as well as possible in helping people who need to avoid the consumption of gluten. If you have any questions or comments, please feel free to post them in the comments section here. It is quite possible that suggestions that you make here will be implemented in future versions of this app. Do you sometimes want to get yourself to a coffee shop as soon as possible, but aren’t sure of the fastest way to get to one? Do you spend time in places that aren’t familiar to you, and find that you want to go to the nearest coffee shop, but you aren’t sure where that nearest cafe is? If you find yourself in situations like these, then you may want to have an app on your smartphone that lists which cafes are closest to you and can display a map that shows where those coffee shops are. 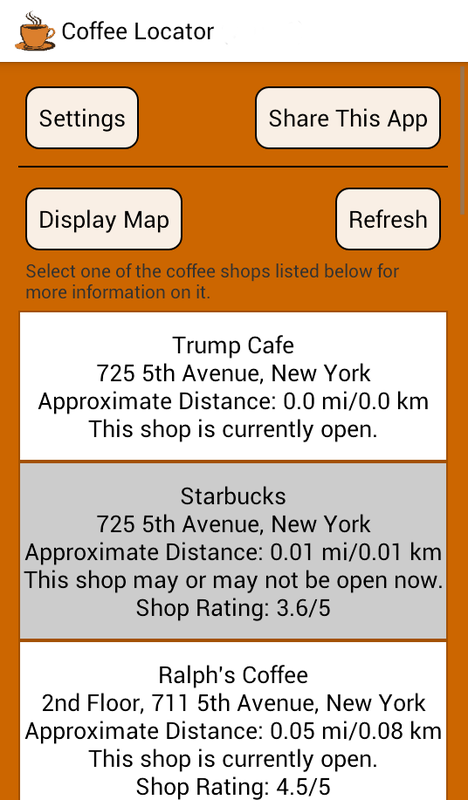 Well, we have released Coffee Locator, an Android app that can tell you where the nearest coffee shops are and can tell you how to get to them. 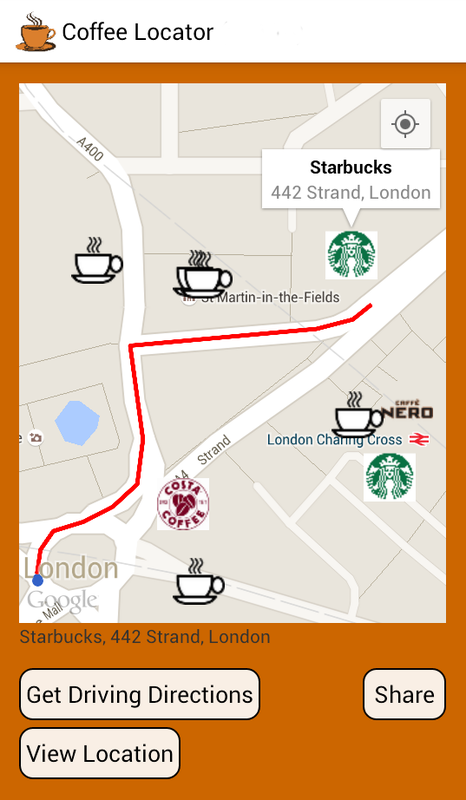 After you open Coffee Locator, it uses information on your location to discover where nearby coffee shops are. It’ll then display a list of nearby cafes with the closest ones listed first. If one of these cafes is one that you’d like to visit, you may display a map that shows your location and the shop’s location by tapping the button that contains that shop’s information. Or you could simply display a map that displays the location of every nearby coffee shop that was found by tapping the button to do so. After displaying the map, you’ll have a better idea of how to get to the shop of your choice. But wouldn’t it be great if the path that you could take from your location to that shop were drawn on the map, telling you exactly how to get there? Especially if you were not very familiar with the area where that shop is? Well, after selecting the option to get directions, you’ll get more than just a list of the directions that you’ll need to take to get to that shop. A line on the map will be drawn from your location to the shop, giving you an even better idea of how to get there. If you’re not familiar with one of these cafes or the area where that cafe is, you may want to use Google Street View to take a look the area near that coffee shop. Well, as you may have noticed in the above screen shot, the option for doing that is there. You may have also noticed that this app gives you a quick way to share that shop location with others. So if you want to notify anyone by text, e-mail, or social media that this cafe is where you’ll be, you may select that option to quickly and easily do that. There are two different versions of this app that you may install. One version is a free version that contains ads. But for less than the price of a small cup of coffee that you can get at most or all of the cafes that this app would tell you about, you may buy Coffee Locator Pro, the ad-free version of the app. You may download and install either version of Coffee Locator from Google Play by clicking one of the links below. Please feel free to post any questions or comments about this app in the comments section here. We would like to make this app as good as possible. And the more feedback we get on how it can help you get to your favourite coffee shops as quickly and efficiently as possible, the more improvements we can make to this app. Posted in Android Apps, Coffee Locator. 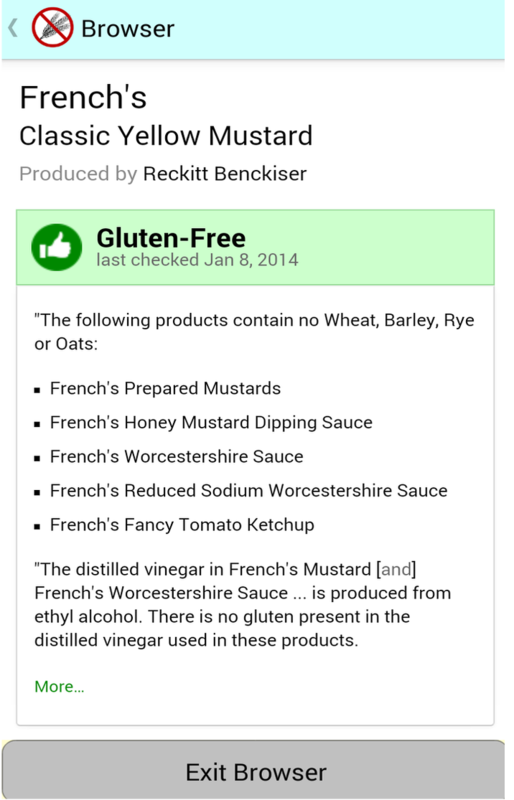 It has been two years since we released an Android app for helping people determine if products are gluten-free. Thousands of people have installed and used this app. And we hope that it has helped many people who need to avoid gluten in their diets. However, this app was actually made for one person in particular. On the second anniversary of the release of our app titled “Is This Gluten-Free?” we thought that the story behind this app should be told. This is Kristi. For a long time, she often felt ill without knowing why. She eventually discovered that the reason she felt ill so often was because she had celiac disease. As those familiar with celiac disease know, to avoid being in any discomfort, she needs to avoid consuming anything that contains gluten. 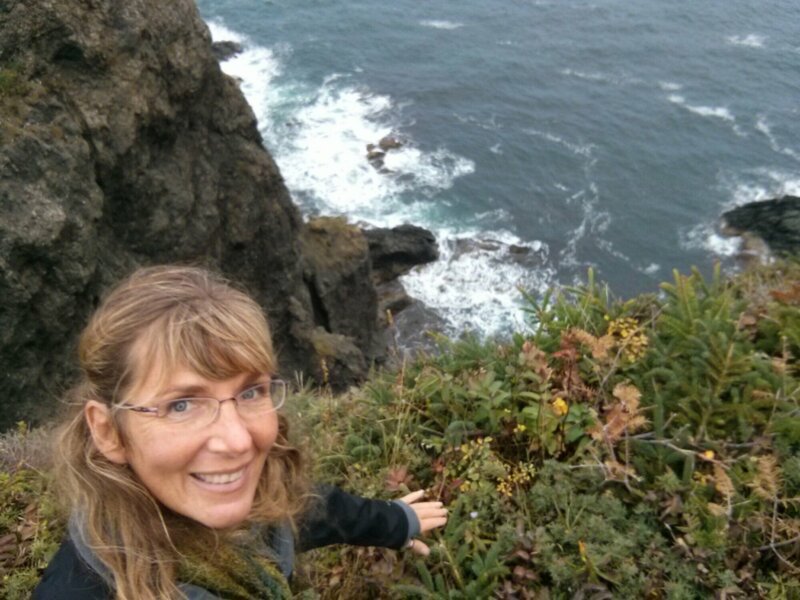 And as Kristi is a vegan, her dietary choices became quite limited after she discovered that she had celiac disease. What made matters even worse for Kristi was that products do not always have indications on their packages that they are or are not gluten-free. Kristi’s boyfriend, Mike, thought that a smartphone app that would determine if a product is gluten-free after that product’s barcode is scanned would be good for her to have. 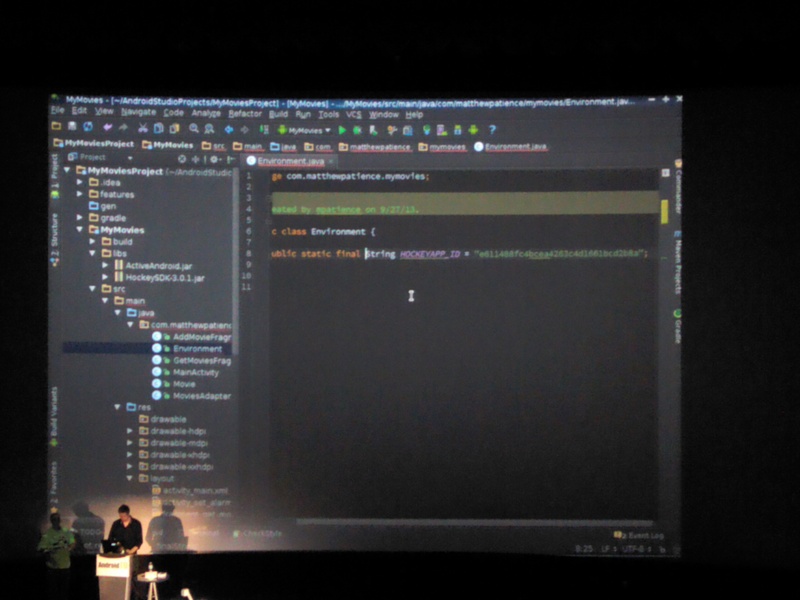 As I had experience with writing software using the Java programming language that is often used in writing Android apps, Mike asked me if I could write an app like this. In fact, our first discussion about this was actually at a hotel bar while we were on vacation together. 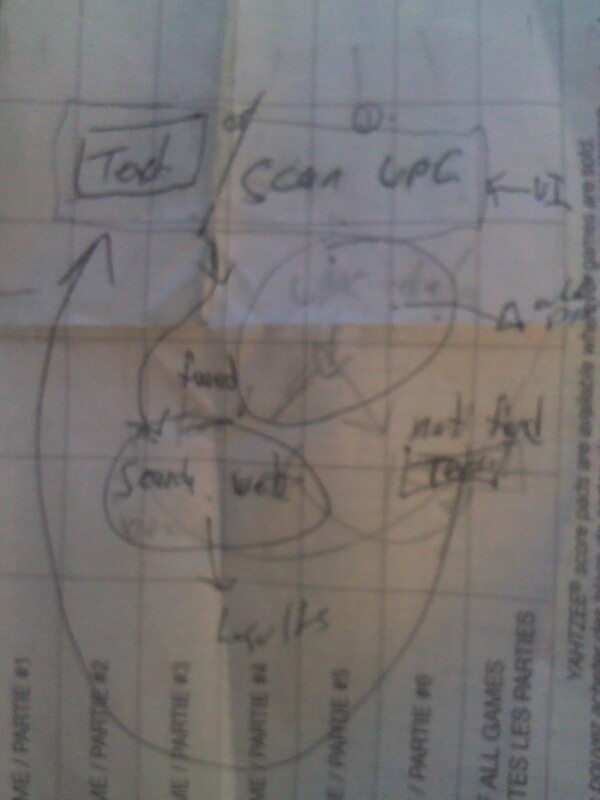 It was there where on a scrap piece of paper, he sketched this diagram of how the app would work. 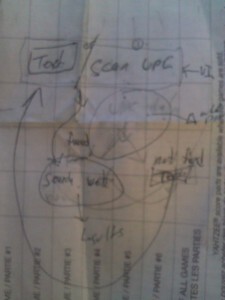 Although this diagram may not be entirely clear, Mike’s explanation of how the app would work combined with that diagram helped me understand what he wanted. You may be able to see how the diagram indicates that users could try to enter a product’s name manually or by scanning the product’s UPC code. And it indicates that however the product’s name is entered, users would then be able to search websites to determine whether or not the product with that name contains gluten. After understanding that this is how this app would work, I decided to try to write an app that would do this. 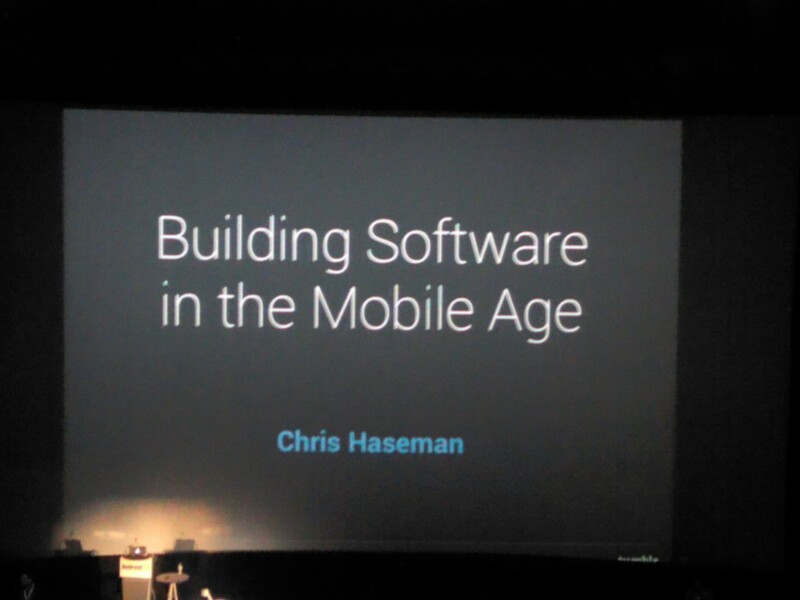 I had experience with writing software, although I had no prior experience with writing Android apps. 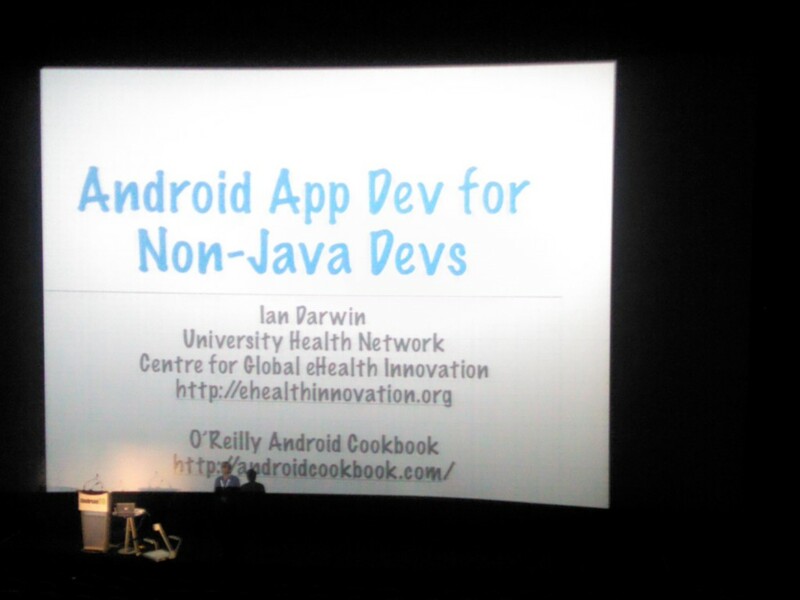 And writing Android apps certainly can be challenging. However, knowing that what I was writing would make it easier for at least one person with celiac disease to determine if products contain gluten is what motivated me to work through any challenges. I thought that Kristi had to find it difficult to be a vegan who also needs to avoid consuming gluten. And so I wanted to write this app to make Kristi’s situation less difficult. After finishing work on this app, we made it available here on the Google Play store. We thought that if Kristi found it useful, other individuals who need to avoid consuming gluten might find it useful as well. If this app helps make it easier for people with celiac disease or gluten intolerance to avoid consuming gluten, then it was well worth it for us to spend much time developing it. It has been a long time since the last post to this blog. We have been very busy with developing another Android app that you may find quite useful. 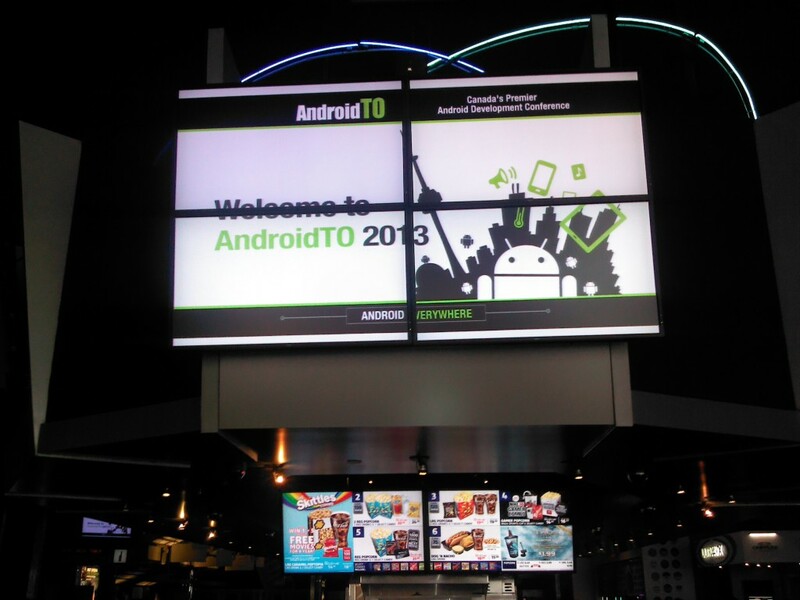 However, we are not too busy to pay attention to feedback regarding the Android app that we have released. Although it has been said that it is easy to use, we understand that there may be some confusion and misunderstandings that some might have when using our “Is This Gluten-Free?” app. In this post, we hope to clear up any confusion regarding use of this app. With this app, you may try to determine if a product contains gluten by first entering that product’s name into a search box. You may do so by typing it in, or you may scan the product’s barcode to try to automatically enter the name of the product. However the name of the product is entered, you are given a choice of methods to search for information online to determine if that product contains gluten. A screenshot of the app in which this choice of methods is given is pictured below. We have decided to make GFOverflow.com the default website for determining whether or not products are gluten-free. As that site contains information on over 10 000 products, there may not be a better place on the web for finding that information. 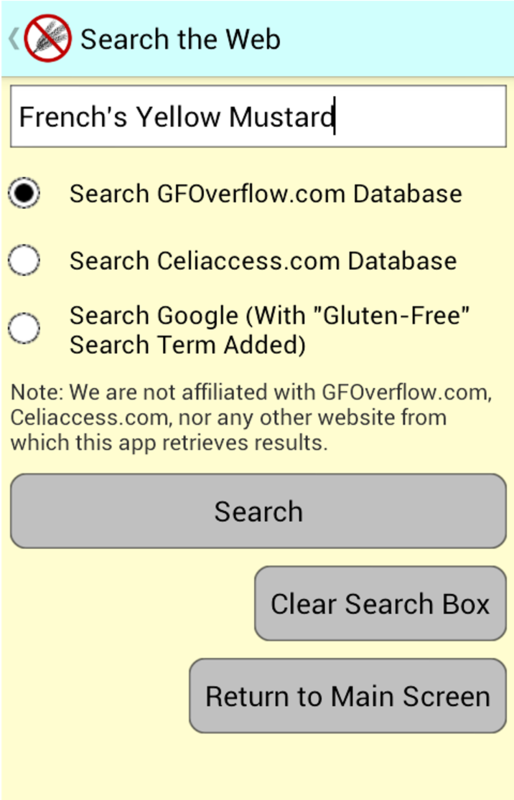 And when you choose to search for information on products on GFOverflow.com through this app, the app displays a page on the GFOverflow.com site that may list search results related to the product name entered previously. A screenshot of this search results page is pictured below. In this example, only one search result is listed. However, we have found that some were led to believe that any products listed on search results pages were gluten-free after seeing the “thumbs up” image that is there. That image is not actually an indication that any products listed on this page are gluten-free. To actually determine if a product listed in search results contains gluten or not, you will need to select that product’s name. After selecting that product’s name, a web page with information on that product should appear. Pictured below is a screenshot of the web page that appears after selecting “Classic Yellow Mustard” from that search results page. As this page indicates, this product does not contain gluten. Therefore, it is this kind of page, one in which it is clearly indicated whether or not a product is gluten-free, that you want to find when searching GFOverflow.com. With this app, we have tried to make determining whether or not products contain gluten to be as simple and convenient as possible. And we hope that this explanation of how you can find this information through this app will help clarify any confusion regarding what is on external web pages that the app displays. 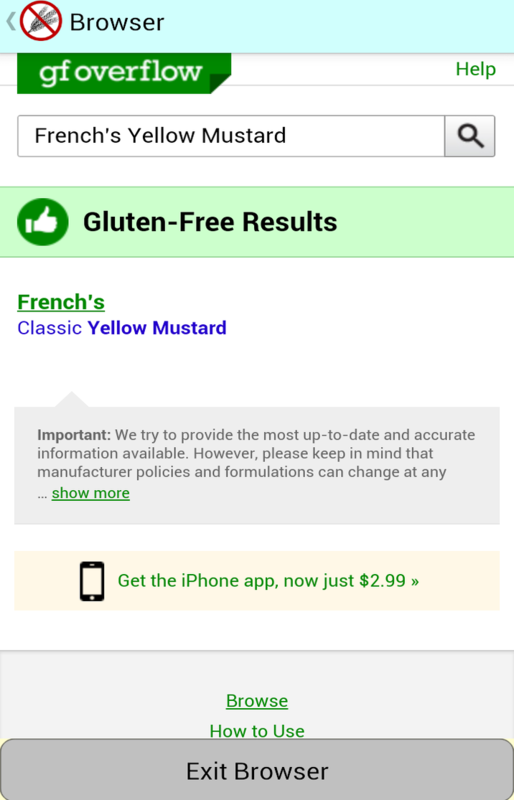 We have continued to receive feedback on our Android app titled “Is This Gluten-Free?” since it was first released. However, not all of the feedback on it has been positive. We understand that when using the app to scan the barcode of a product, the name of that product may not be found by the app. We also understand that when checking information online to determine whether a product contains gluten or not, that information may not be available. Some may be disappointed to find that certain information cannot be found through this app, and we can understand this disappointment. We would like this app to be as useful as possible to those who try to avoid the consumption of gluten. So this lack of information in databases used by this app is one that we are addressing. It has been said that an app such as this one is only as good as the databases that it searches. And these databases do not always contain the information that users may want to find. These databases are maintained by people who put much time and effort into making information related to barcodes and products publicly available. And software such as this app relies on this information that is made available through these databases. Online databases that can be accessed through websites such as UPCDatabase.com, UPCDatabase.org, and SearchUPC.com rely on contributions from people who volunteer to give this information. Therefore, if you would like software that relies on these databases to be more reliable, you may volunteer to contribute information on barcodes and their associated products to these sites. We have contributed information to these sites, and we continue to do so. And if you contribute information to these sites as well, then you will help make “Is This Gluten-Free?” and every other software application that uses this information more useful. Online databases that contain information on whether products contain gluten or not such as GF Overflow and Celiaccess are maintained by individuals who try to make this information publicly available and accessible. 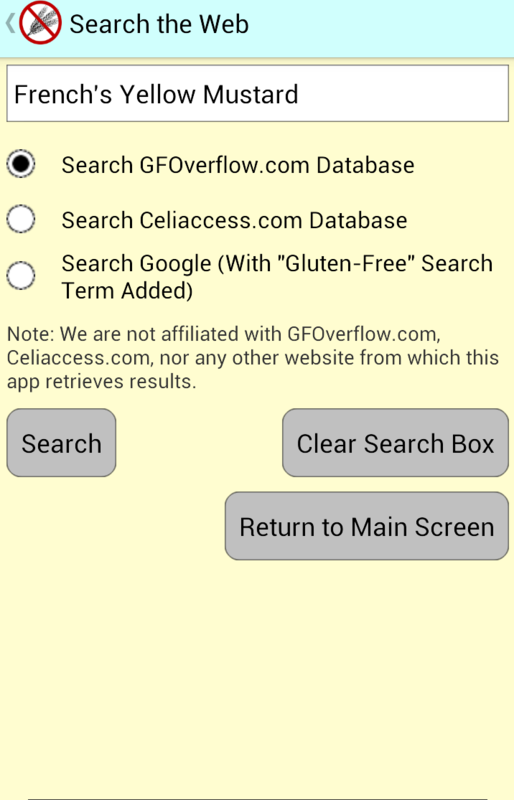 And while GF Overflow only gets information directly from the manufacturers of products, Celiaccess relies on contributions from a community of users who avoid gluten in their diets. As more information gets added to databases such as these, this app will become more useful. We appreciate the efforts made by those who make the information on which this app relies publicly available. The app that we wrote could not exist without the work done by these people. “Is This Gluten Free?” is an app that simply takes the information that is made publicly available and makes that information more easily accessible to those who can use it. It was shortly after we released an Android app titled “Is This Gluten-Free?” that we received feedback on it. And what we found is that there is interest in it in the United Kingdom. Unfortunately, the app is currently only available through Google Play in the United States and Canada. This is because we have been unable to ensure that this app will work well outside of the U.S. and Canada. And we prefer to ensure that this app will work as well as it should wherever it gets used. We understand that products in the U.K. are more likely to have indications on their packages whether they are gluten-free or not. However, we also understand that some individuals there would still like to use this app. There may be individuals in a number of other countries who would also like to use it. However, we prefer to ensure that it has been tested as thoroughly as it should be in other countries before making it available in other countries. For these reasons, we are currently looking for individuals in the U.K., and perhaps other countries outside of North America, to perform beta testing on this app. We would like to hear from anyone in these countries who is interested in working with the app and in reporting detailed information on how well it works in these countries. If doing this would interest you, then you may indicate your interest in doing so by filling out this contact form that can be viewed here. We apologize to those of you outside of the two countries in which this app is currently available for not yet being able to ensure that the app will work well where you are. However, we want this app to work as well as it should in your country. And we are doing what we can to ensure that it will help you determine if products are gluten-free or not where you are. There are a number of reasons that some individuals may have for avoiding gluten in their diets. Some have celiac disease, and so they need to ensure that what they consume is gluten-free. Some have gluten intolerance or gluten sensitivity, and so they would want to avoid consuming gluten whenever possible. Whatever reasons people may have for avoiding the consumption of gluten, they would certainly want to determine if certain products are gluten-free. However, many products do not indicate on their packages whether or not they contain gluten. Those who either need or want to avoid consuming gluten can often be unsure of whether or not they should avoid consuming some products. Methods for helping individuals quickly and easily determine if products are gluten-free can be useful. An application for the Android operating system titled “Is This Gluten-Free?” has been made to help users easily access information online on whether or not products contain gluten. This Android app has been designed to be simple, yet useful. With this app, you may first try to enter a product’s name automatically into a search field by scanning the product’s barcode. After scanning a barcode, the app tries to retrieve the product’s name from online databases that contain information on millions of UPC codes and their associated product names. And if necessary, you may choose to manually enter the product name into a search field. The screenshot below shows the main screen in which you can choose to scan a UPC code, or go directly to the section for searching online for information on products. Then with the name of the product entered automatically or manually, you may then search websites that contain information on thousands of products and whether or not they contain gluten. So this app helps you determine if a product contains gluten or not when you have that product and an Internet-connected Android device with you. And if you don’t have the product with you, you may still enter the name of it into the app’s search field to easily search online to find out if it is gluten-free. You may find this app on Google Play by clicking the link below. If you have any questions or comments on this app, please feel free to post them in the comments section here. It can be difficult and inconvenient to ensure that products are gluten-free. We hope that this app will make it less difficult for those who must determine whether or not products are gluten-free.